Attaches bumpers, handles, trim, grill covers, and more! Automotive attachment tapes provide a continuous seal with no gaps to eliminate water and dust intrusion and reduce noise. Tape gives an aesthetically pleasing, low-profile appearance and low maintenance application as opposed to traditional fasteners like rivets, screws and clips. Supplied in rolls, spools, or even custom die cut parts for after market accessories. 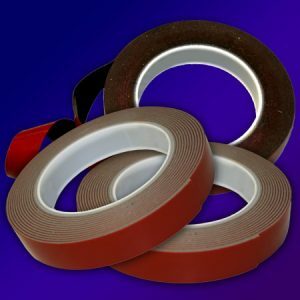 Double sided high bond adhesive tape is self wound with red film liner on one side. Available in black, gray, white and clear. Foamed acrylic tape provides very high bond strength as well as high tensile and shear values for a lifetime bond. UV, water and wind resistance make for superior performance. Simply remove the liner and apply pressure to stick. In some instances a roller may be used. Surfaces should be clean and dry to achieve maximum performance. Very high bond adhesive will reach maximum bond strength within 72 hours. High bond attachment tapes provide life-long adhesion for outstanding performance.